Whether you call energy bites or energy balls, these are the same thing. These are loaded with nutrients to keep you focused and healthy. Anybody can pop them as an easy breakfast or a quick snack or a source of protein before any workout or even occasionally as a sweet dessert. 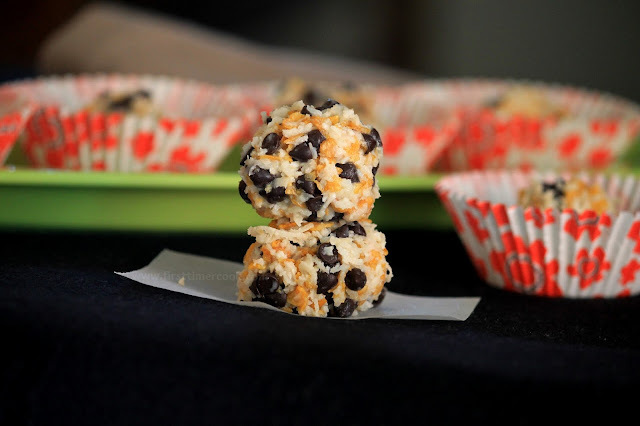 These no-cook energy bites recipe is super simple to make. Mainly the preparation method includes combining a few ingredients, rolling tight in shape of balls, keeping in the refrigerator to bind perfectly. 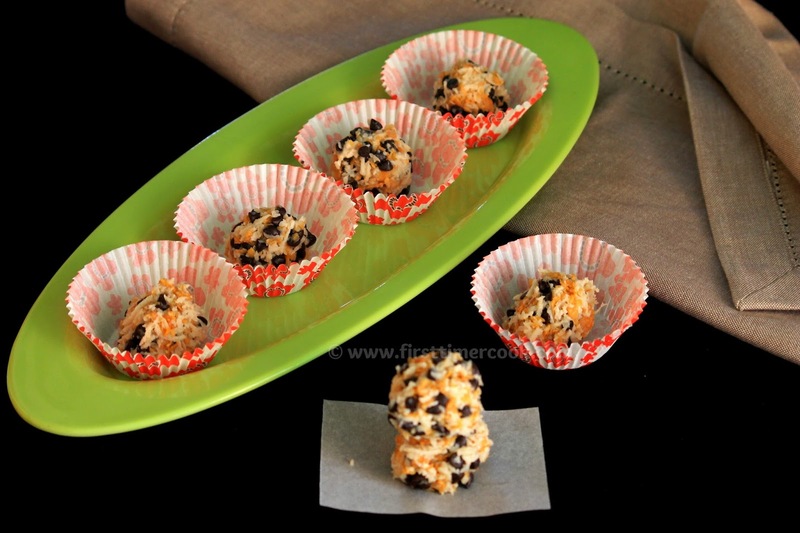 These choco-coconut energy bites are the combination of chocolate chips, shredded coconut and some cornflakes along with condensed milk. Here I have not used any dry-fruits, but if you want then just add some chopped dry-fruits which gives an extra crunch. These energy bites are the perfect fuel for on-the-go munching which best suits as snacks for kids. Next time when you need an afternoon pick-me-up or a post-workout nibble, then just go for these choco-coconut energy bites for which you have to go in details method of preparation as mentioned below. Crush all the cornflakes roughly and keep aside. Take condensed milk in a mixing bowl. 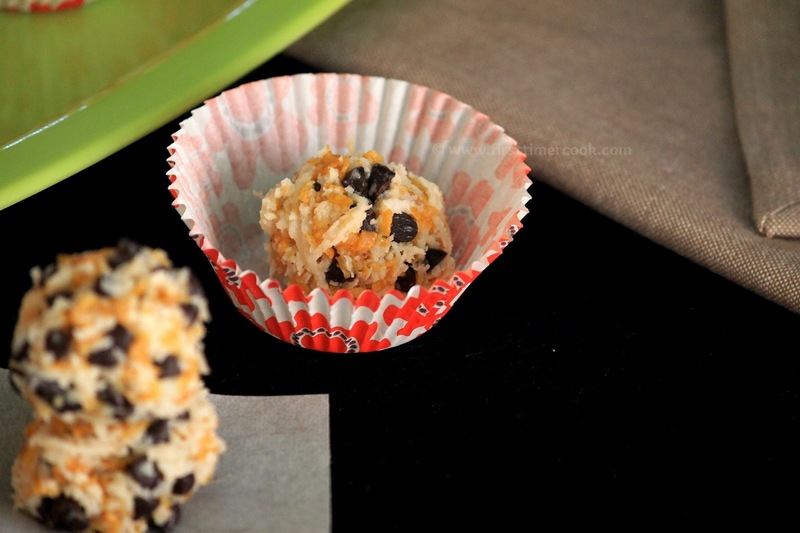 Add shredded coconut, chocolate chips and crushed cornflakes. Mix everything using a spatula until a thick dough has formed. Scoop out a small amount of the dough, roll into a ball using hands. Keep in refrigerator for 15-20 minutes to well set, then serve and enjoy ! Replace chocolate chips with chocolate chunks if not available. Chopped dry-fruits can be added to give extra nutty crunch. We would like you to upload your recipes on our website. All you have to do is, just sign up and add your recipes or if you want we can add your recipe into your profile after signup on your behalf (If you permit us) and will promote you and your recipes. You can back link your blog/website in your recipes. Also, you can add YouTube video link along with your recipes. Check out our current offers on http://www.onfoodie.com/offers/.